I was driving through Indiana last night and caught the last portion of Radiolab. Apparently, an episode from last summer wherein they were talking about language and how it impacts thinking. They were looking at some people who had grown up under different/unusual language circumstances... deaf people who created their own sign language, for example. The basic conclusion -- if you can really call it "basic" -- was that the language we learn and use has a direct and notable impact on how our brains process information. One of the examples they brought out was this group who created their own sign language when they were kids a few decades ago. It was taught and passed down for the next generation or two, and there are people in their 40s with this language, as well as kids in their pre-teens. Not surprisingly, the actual language grew and evolved, but more significantly, the younger kids had different thought processes than the adults. The adults had only come up with one sign for "think" while the kids had a variety to work from: "think", "understand", "believe", "dream", etc. Going hand in hand with that, psychologists found that the kids did a much better job of comprehending what other people might be thinking and feeling than those older people who had fewer words to work with. The kids were "thinking about thinking" while the adults simply did not. They also spoke about another deaf man who did not have a sign language at all for many years. He grew up to adulthood having essentially no language capabilities at all. (I didn't catch many more details than that. I tuned in to the program part-way through.) But, interestingly, once he did learn language, he began to think differently. He would never elaborate much on it, but he seemed to suggest that, prior to language, his thought process was more primal in nature. Eating, sleeping, shelter, etc. Having language allowed him to process the world differently and think in larger, more abstract terms. Now let's slide this conversation over to comics. Comics have a language component, obviously. But beyond the typical word balloons and narrative boxes and sound effects you might be thinking of, the comics are something of a language unto themselves. The way you read comics is different than how you read English. (Or Japanese. Or French. Or whatever your native language is.) 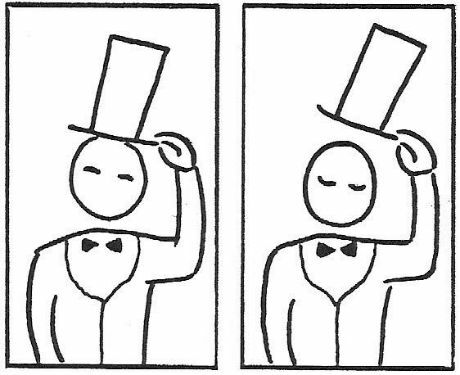 Think of the now-classic anecdote in Understanding Comics where Scott McCloud's mother saw two separate pictures instead of a single sequence. She couldn't "read" the language of comics. Despite being able to see the images and read the English words in a comic book, she couldn't read comics. If your understanding of language(s) shapes how you think, how your brain processes information, wouldn't having the ability to read comics imply that comic readers think differently than non-comic readers? I don't know what that difference might be -- maybe comics folks can more readily break tasks down into component parts, maybe they have a better understanding of spatial relationships, maybe they can better differentiate discrete chunks of information, etc. -- but it seems to me that such a distinctly different type of language (comparing comics to English, as opposed to comparing Spanish to French) that almost has to come with some kind of different way of brain processing, if my understanding of that reporting was accurate. Neil Cohn is probably the best known person in comicdom that's doing actual research along these lines, but to the best of my knowledge, he has not (and, Neil, please correct me if I'm wrong) specifically written on the psychological angle of being able to view the world differently because of a different language base. But that would make for an absolutely fascinating study, I think: seeing how comic readers think differently than non-comics readers. (Let me be clear, too, I'm talking about people who CAN'T read comics, not people who DON'T read comics.) My obvious bias would be to assume that it would provide an advantage to be able to think as a comics reader, but I would certainly like to see what/how that might manifest itself. Wow. I had no idea the inability to read comics was widespread. I have only encountered it once. 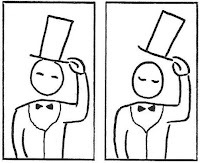 I was trying to show someone Girl Genius, and they were okay when the page was in a standard left-to-right, 3 rows of 3 panels each format, but when they hit a page with a nonstandard format, they could not figure out where to look. It became incomprehensible to them. I honestly have no thoughts on why some people can't read comics, but I'd be very interested in finding out why. Hmmm . . . do those people also have trouble with websites? This is a very interesting point. I have a few friends and of course some relatives that really aren't sure how to "read comics." To their credit, gridded, uniform layouts tend to make more sense to them, as that's presumably much more akin to simply reading rows and rows of newspaper comics in their minds. But I've definitely had to literally point some people in the right direction as they've tried to immerse themselves into a comic—even though the comic in question would be adequately readable to someone who reads them on the reg. So really, "reading comic books" is quite like reading another language. English (or what have you) is only part of the package; just as one learns his first language, the "language" of comic books might be its own thing as well, with its own set of rules to learn. This actually sounds obvious, but perhaps it's just the depth and dynamism of comic book storytelling that makes it more than just reading in English, or reading in French, or reading in Japanese—depth and dynamism fluent readers take for granted, but which new, unpracticed readers don't quite expect. Part of the inability to read comics might stem from people's inability to properly combine words & pictures together into a cohesive whole. I know my mother likes to read the caption, while barely glancing at the pictures of the characters themselves. She's able to think in words, and I'm able to think in pictures, so naturally comics come easier to me. What makes me different from other comic readers is that I interpret comics differently. When reading, I convert words to pictures, and pictures into sound. For a long time, I thought everybody else read the same way I did, and it took me a long time to find out this wasn't the case. comics really are their own language. that being said, in order to fully embrace the medium, a reader has to be somewhat versed in the visual shorthand cartoonists apply. even then, the interpretation is still wide open... no two readers will get the exact same experience. many people see words and images as separate entities...they're either reading all he words and not giving weight to the images or vice versa. those not able to combine the two miss out. Thanks for the shout out! I haven't specifically looked at how comic reading changes perception, but I do have evidence that experienced comic readers' brainwaves respond differently to reading comics than less experienced readers. Almost all of my studies seem to show some "fluency" effect like this, but I haven't yet done any testing on tertiary abilities. There is also some evidence from studies that hint that comic readers have better spatial conception and perceptual skills, but those studies are from pretty long ago and without much detail (they were done in India, of all places).